A few days ago, Dorian and her Mum from Dorian’s Hand nominated me for the Very Inspiring Blogger Award. What is this all about? 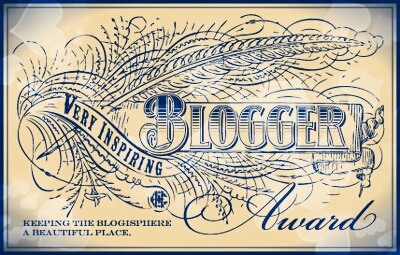 Well its a way to thank and recognise those who’s blog you have enjoyed or been inspired by. Its also a way to highlight then the different blogs you follow and pay-it-forward in the blog-a-sphere. I will find time to pass on this good karma and be sure to give you a shout! :-). See, I knew I liked you! Well done! No middle name? My husband and every generation before him also have no middle names. I changed it up a little and gave our kids two!! It was cultural in my husband’s instance. He’s Macedonian. They don’t tend to have middle names. I actually googled it last night, it’s fascinating! I am of English/Scotish descent but growing up it was definitely the exception – very unusual for both my sets of grandparents to buck the trend.